Mind Maps are useful and elegantly simple devices. In essence, Mind Maps are simple drawings or sketches of associations you hold between things in your mind. They normally start with a central topic, either in words or even better if expressed as an image. You then draw branches off from that image of the concepts that spawn from the central image. 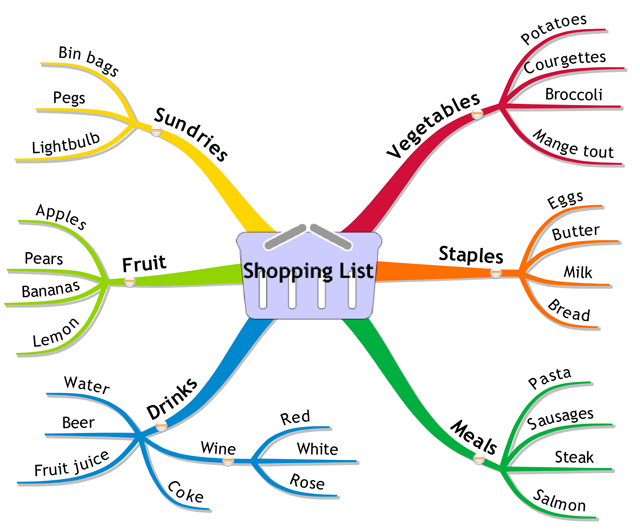 So if you Mind Mapped something relatively trivial like a shopping list you might have a central image of a shopping trolley and branches such as fruit & veg, household, frozen food, beer & wine, dairy and desserts. You can see what my typical shopping list is like. To make it even more memorable, you can use images of products on each branch. 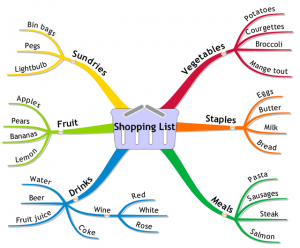 What makes such a trivial Mind Map so powerful is that with a little training, you can forget to take the shopping list along, yet easily memorise all of its contents. I always Mind Map any talk I give on a single sheet of paper and am then able to reproduce all the points I want to get across without any notes or slides. You can just imagine the internal dialog between the hemispheres when you are Mind Mapping. The same type of ‘dialog’ occurs when we are painting or writing or when we’re typing on a computer or using a mouse or tablet. So most of our days are spent flipping from one hemisphere to another. It used to be thought that the structure called the corpus callosum mainly passed information between both sides of the brain. Current wisdom is that it actually suppresses one side while the other carries out a task. The map gets both sides of the brain in on the action. Their real power is unleashed when you map associatively, i.e. using one word per branch, as this takes you off in unexpected directions and mimics our neurons’ interconnective structure. Although there are many good software-based Mind Mapping tools on the market, some of the best Mind Maps are done with just coloured pens, pencils and paper. The reason for this is that some people can end up in a left brained mode simply by engaging with a computer keyboard, screen and mouse. When we have a pen or pencil in our hands not only do we use different neural pathways in our brains but the map manifests into physical, as opposed to virtual, reality. This leads to a better chance of your map leading to real world results. If however you do want use computer software, make sure you print your maps out and stick them on a notice board or wall. When it comes to whole brain thinking, the impact of Mind Maps is explosive in the context of the creativity they seem to unleash. 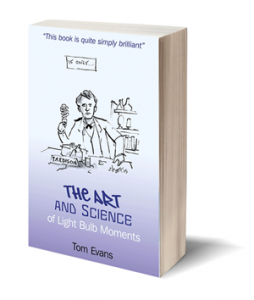 They are also really useful for aiding memory and brilliant for anyone studying and revising. If you do have children, my advice is to get them Mind Mapping as soon as possible.